Today is a big day in our readings! We are introduced to Abram & Sarai! Genesis chapter 12 is significant in that it transitions our Old Testament readings from being about the world at large to being primarily about a specific man, Abram, his family, and his descendants. 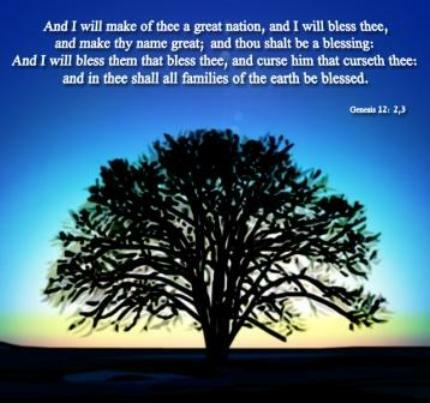 Verses 2 and 3 are an amazing promise from God to Abraham: "I will cause you to become the father of a great nation. I will bless you and make you famous, and I will make you a blessing to others. I will bless those who bless you and curse those who curse you. All the families of the earth will be blessed through you." This is a powerful promise that we will see played out throughout the rest of our Old Testament readings - and into the New Testament this promise continues and is fulfilled in Jesus - and continues in us as spiritual descendants of Abram today. I heard somewhere once that one way to paraphrase this promise is "I will bless you, so that you will be a blessing to others." And I think about that today for our own lives. If we have been blessed by God, is it possible that we have been blessed in part so that we will be a blessing to others? Do you believe that you been blessed by God? Are you passing along that blessing to others in your life? Bible.org's commentary on today's readings in Genesis titled "The Unity of Unbelief" is at this link, "The Call of Abram" is at this link, and "When Faith Fails" is at this link. ""You're blessed when you're at the end of your rope. With less of you there is more of God and his rule. "You're blessed when you feel you've lost what is most dear to you. Only then can you be embraced by the One most dear to you. "You're blessed when you're content with just who you are--no more, no less. That's the moment you find yourselves proud owners of everything that can't be bought. "You're blessed when you've worked up a good appetite for God. He's food and drink in the best meal you'll ever eat. "You're blessed when you care. At the moment of being "carefull,' you find yourselves cared for. "You're blessed when you get your inside world--your mind and heart--put right. 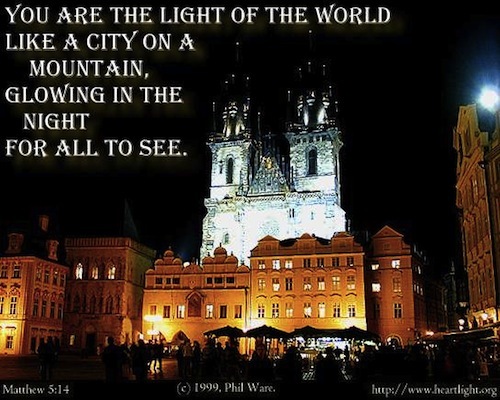 Then you can see God in the outside world. "You're blessed when you can show people how to cooperate instead of compete or fight. That's when you discover who you really are, and your place in God's family. I know verses 17 & 18 probably are interpreted in different ways - but a friend of mine has encouraged me when in doubt, just stick to the text, which is wise. 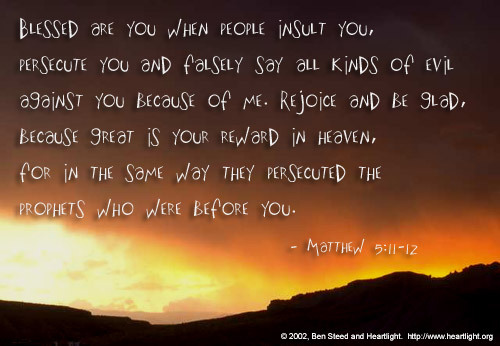 So, let's look at the Jesus' words here in this text - "Don't misunderstand why I have come. I did not come to abolish the law of Moses or the writings of the prophets. No, I came to fulfill them. I assure you, until heaven and earth disappear, even the smallest detail of God's law will remain until its purpose is achieved." What does the reading of this text say to you? And now that we've looked at the text... I need to dive into a commentary on these verses... :) I'm quoting this from Tyndale's One Year Bible Companion book - which I have found to be a very helpful commentary to our daily readings: "In the Old Testament, there were 3 categories of law: ceremonial, civil, and moral. 1. 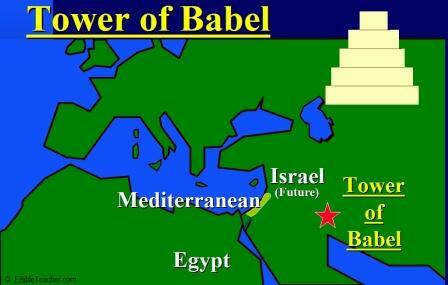 The ceremonial law was related specifically to Israel's worship. Its primary purpose was to point forward to Jesus Christ; these laws are therefore no longer necessary after Jesus' death and resurrection. However, the principles behind these laws - to worship and love a holy God - still apply. 2. The civil law applied to daily living in Israel and these laws cannot be followed specifically today in our modern society and culture. But the principles behind theses laws are timeless and should guide our conduct. 3. 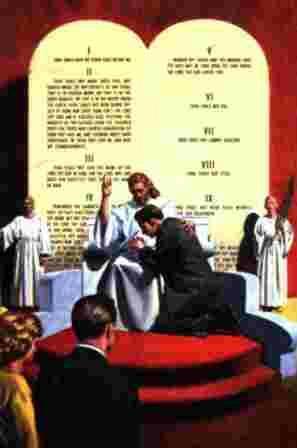 The moral law (such as the Ten Commandments) is the direct command of God, and requires obedience. The moral law reveals the nature and will of God, and it still applies today." So, there you have it from one evangelical commentary. I know probably different people reading this blog are going to interpret these verses a bit differently. This framework of these 3 categories of laws above and their fulfillment in Jesus I personally have found helpful and agree with. One other commentary I found related to these verses says this: "Christ does not terminate the law. Do we then make void the law through faith? God forbid; we establish the law. (Romans 3:31) The law will always be there to point out what sin is, but the law is not the focus, Christ is the focus. Only He can cleanse, and sanctify and change the heart and mind." Again, I know this can be a hot topic to say the least. I recommend everyone please spend a few minutes reading this wonderful article on this topic from Bible.org titled, "The Mosaic Law: Its Function and Purpose in the New Testament," at this link. 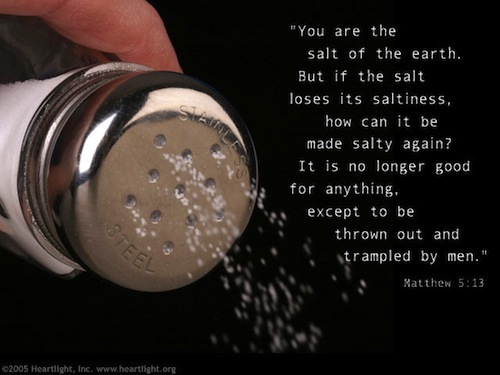 Bible.org's commentary on our readings today in Matthew titled "The Beatitudes" is at this link and "A Pinch of Salt in the Recipe for Persecution" is at this link. Psalms - I love Psalm 5 verse 3: "Listen to my voice in the morning, LORD. 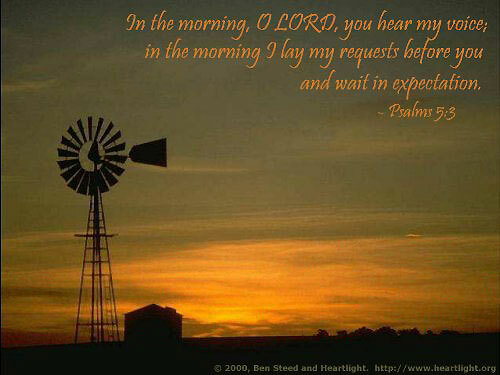 Each morning I bring my requests to you and wait expectantly." This is a great reminder to pray in the mornings - before we start the hustle and bustle of the day. I know that many of you are reading the One Year Bible readings in the morning, which I think is a great way to start your day! I do see a huge positive difference in my day if I do pray to God in the morning and pray specifically about the upcoming day - and pray for others that I will interact with that day as well. Praise God for the morning! Actually, while I'm talking about the morning here, let me go off on a tangent if you don't mind... :) I honestly have lived much of my life as a "night owl." I went to bed late and woke up late. And I had all kinds of good "reasons" of why I was a night owl. But, I will be honest here - I don't think being a night owl was good for me. I honestly believe there is so much wisdom in the old adage of "early to bed, early to rise, helps make a person healthy, wealthy and wise." I personally think that being a night owl was a lack of discipline on my part. I don't mean to say all this to make you other night owls out there feel guilty... :) But, I do want to encourage you, in that if you think you are stuck being a night owl the rest of your life, I don't think it is true. I believe you can make the transition to being a morning person. I am an example of someone who has transitioned from being a late-night person to an early-to-bed person. (well, yes, I'm still a bit in the transition phase sometimes it seems...) And I am here to tell you, mornings rock! Early mornings are so beautiful and peaceful! They really are an amazing time of the day to connect with God... Praise God for the morning! Proverbs - Our readings in Proverbs 1:24-28 today is a great reminder to not ignore an opportunity to gain wisdom when the opportunity comes, or we may regret it later. Is wisdom knocking on your door today? Will you let Wisdom enter in? Worship God: Psalm 5:3 in today's readings reminded me of the wonderful worship song "A New Hallelujah" by Michael W. Smith. Here's a great live version of the song featuring the African Children's Choir from Uganda! Have you ever sung "A New Hallelujah" to God? Click here and sing! Prayer Point: Based on Matthew 5:14,16 above, pray to God that you will let your light shine before others in this new year. 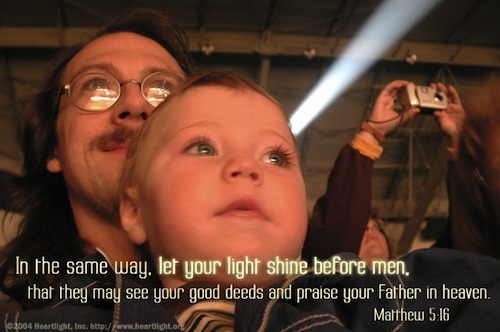 Pray that God would show you how we wants you to truly be the light of the world this year. And pray that you will give all of the glory to God for your good deeds. Comments from You and Questions of the Day: Based on our Psalm 5 reading today, what do you do in the morning to set your mind and heart on God? Is it prayer, reading the Bible, reading other devotions? If you wouldn't mind posting up in the Comments section below, I'd love to hear what others are doing? It always encourages me - and oftentimes gives me other ideas of things I might want to be doing as well. Thanks! Also, what verses or insights stand out to you in today's readings? Please post up by clicking on the "Comments" link below! MIke--I am a morning person. Even when I want to sleep in my body’s alarm clock begins ringing at 5am. I do my reading time is in the morning. I have a second read through the bible program that I usually use first. Then I read a chapter in Proverb, and finaly a come to the BLOG. What I post, whether A.M or P.M, usually comes out of my Devotion/quit time. When I read the Word in the morning, there seems to always be a verse, a passage or passages that dwell in my mind all day, which I then mediate on. I am a journaler and what I journal usually winds up here, or at least part of my thoughts get posted here. The whole earth had a common language and a common vocabulary. When the people moved eastward, they found a plain in Shinar and settled there. Then they said to one another, "Come, let's make bricks and bake them thoroughly." (They had brick instead of stone and tar instead of mortar.) Then they said, "Come, let's build ourselves a city and a tower with its top in the heavens so that we may make a name for ourselves. Otherwise we will be scattered across the face of the entire earth." 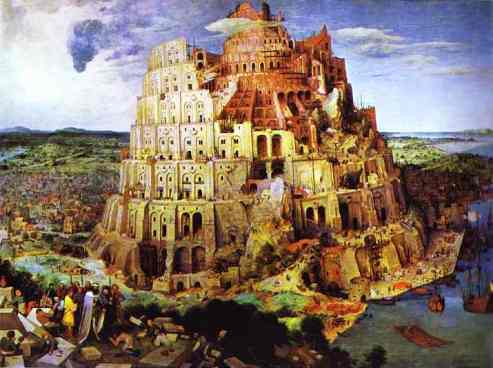 Mike’s words about building a name for oneself has really hit home and has caused me to think about broken relationships held up to the light of the story of the tower of Babel. Could shattered relationships really be the product of trying to build a name for oneself? Are our us-four-and-no-more groups really be about lifting up ourselves to get a name? Did God come down and scatter the relationships because we were going in a direction we were not suppose to be going, up and not out? 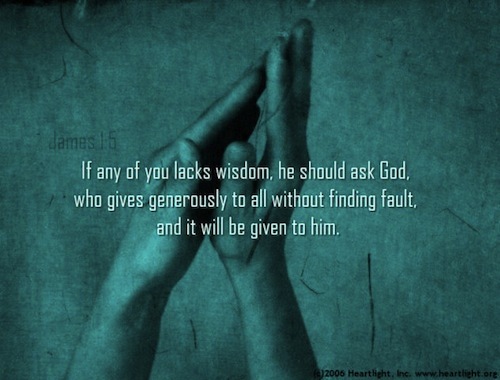 Wisdom or money can get you almost anything, but it's important to know that only wisdom can save your life. Notice the way God does things; then fall into line. Don't fight the ways of God, for who can straighten out what he has made crooked? My focus was on the statement, Notice the way God does things; then fall into line. Funny how what comes out of our mouths, in this case, what is typed out on the keyboard, comes back to hold us accountable, ouch! 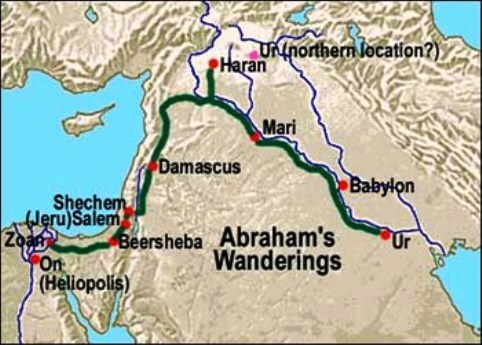 Mike—looking at the Map you inserted in today’s comments I couldn’t help but observe that Haran, where Abram and the gang hung-out for ten years until dad died, seems like a spike in the journey that lead away from Canaan. It is like a spike on an EKG reading heralding a warning of danger to come. I’ve often wondered each time I’ve read through this story what would have happened if Haran had never been a stopping point in this journey. If Abram had arrived in Canaan, the land God would promise to his descendents, but not him, would they have had enough grain/hay and what ever else grows, to stave off the effects of the famine? If Abram had trusted God, in spite of the famine, so that God would prove to him that He would meet all their needs, how would the rest of the story turn out. Abram seemed to be conflicted by two fears pulling inside of him like a perverted game of tug-of-war. Unable or unwilling to trust God in the midst of the famine, fear of starving to death drove him to a country that presented him with another fear, fear of death from the hands of Pharaoh. One fear drove him smack into the other. Fear is a rough taskmaster and allowing it to drive one’s decisions and choices oft times leads to bad choices and regrets. Fear drove Abram to “pimp” his wife to feed himself and his household. He offered up his wife as a sacrifice to save his own life. Can today’s families find themselves doing the same thing? Are we offering up our husbands, wives, children on the alter of a idolatrous god of fear? We may even find ourselves pimping the gospel, offering up half-truth, like Abram, about our situations to avoid or stave off the death of our finances, the death of relationships, family and friends while we construct an alter of justification for doing our deeds: comprise and sin. Finally, if Abram hadn’t gone down to Egypt, would we be reading about Hagar, Sari’s Egyptian hand maiden and the boy Ishmael in the chapters to come, and, the fall-out from that relationship, would we still be reaping the effects today? I wonder about these things because I think about the consequences of my actions and or inactions of following God whole-heartedly. Thank God that He redeems, restores and reconciles us back to Him. Yet walking in His perfect will is so much easier than walking in His Permissive will. All unnecessary bumps are removed when we obey. Wow..good commentary Ramona. Food for thought! 1) well, to answer how I start my day, it's simple, I fix myself a cup of coffee, sit at my dining room table, my calendar of Bible events out, my day calendar out, my bible, my phone to look up one yr bible blog, and my journal. I too am a journaler. I start out with the Word and write my prayers in my journal. I too always find the tower story interesting and even wonder how different it would have been even with our languages today if the people would have obeyed in first place. I know we feel greater in numbers and where two or more agree, in this case hundreds have same idea to reach up to the heavens, first space exploration maybe..the skies the limit..and yes, I know sometimes I get into selfish ways and wish to be honored or glorified for x,y,z . So, we are all human and all sin. Abram, that story with taking Lot with him, why wouldn't Haran raise his nephew, he is married to Lots sister, maybe that would have been too weird, to have your uncle and sister who is also your aunt raise you..anyways and when Abram and Sarai get to Egypt the mention of Lot goes away. Were children never imminent danger or threat. He's young and healthy, I'm surprised that didn't want him as a slave or a worker of some sort..but was never a mention until after they travel again. Things that make you go hmmm..